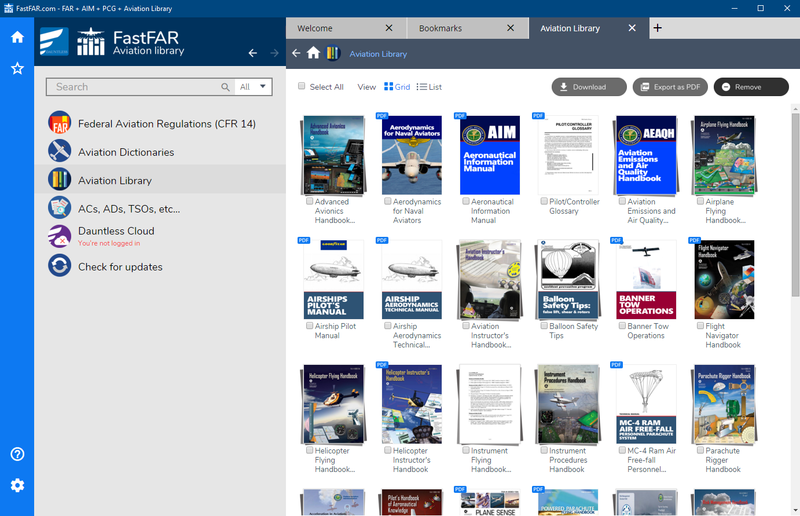 FastFAR provides fast access to the Federal Aviation Regulations (CFR 14), Airman's Information Manual, and Pilot / Controller Glossary in a FAST, versatile, no-nonsense fashion. Sure, they're available online -- but the online versions are tedious and slow. FastFAR gets the conscientious pilot, controller, engineer, or other aviation professional access to key data quickly. At $19.99, FastFAR costs about the same as one of those FAR/AIM books you may have seen, but includes much more information and includes FREE UPGRADES*. The best way to get a feel for the software is to download it from below it and try it out! The demo is free (and if you decide to purchase it, the price is very reasonable.) This sofware is for PCs running Microsoft Windows. The version above is the new/current version. The download below is the older version for those who might still want it. Your PC activation code will unlock either. Upgrading from a previous version? Upgrades are free! Simply download the current version from above and install it atop your existing version. Our small company greatly appreciates all purchases. Your purchase matters. FastFAR includes the (complete) Federal Aviation Regulations (CFR 14, aka the FARs) Parts 1 through 2000 (note: not all the parts exist - many numbers, especially the higher numbered ones, are reserved), and the complete text of the Airman's Information Manual and the Pilot Controller Glossary. Compare this to FAR/AIM books, which typically contain only a sampling of the FAR and AIM. Hey! Why do you call it FastFAR - I thought they were supposed to be called CFR 14 now! Why use FastFAR? Check out this real-world example. Recently (actually, more than six months ago at the time of this writing!) , the powers that be updated CFR 14 Part 61.19. This is not some obscure regulation, but a key one that deals with the duration of student pilot certificates that is of importance topilots and instructors. Let’s try looking it up, shall we? First, as a baseline, check out FastFAR's entry. It represents the current and up to date 61.19 at the time of this writing. Any FastFAR user can get the latest FastFAR dataset automatically through FastFAR's built in self-updater which generally takes a few moments to work either when the program is first starting up or when an update is explicitly started (please note that the font here is small to fit your web browser - FastFAR itself includes a font scaling feature that makes it easy to read). Ok, so FastFAR is up to date. What about other ways that you might consider to look up the same information? Hmm.. what about the FAA's website, then, surely they have more up-to-date information? Surprisingly, this is not always the case. FARs and other material take an odd route to the FAA's website - they have to go via the GPO, and as a result, the FAA's own website can features out-of-date FAR copies. While there is usually at least one up-to-date copy of the FARs on the FAA website, this is not necessraily the one that search engines 'catch', which can lead to problems. For example, at the time of this writing, searching for "FAR 61.19" using Google on faa.gov results in an out-of-date copy being the first result. To the FAA's credit, there is a note there warning that it may be out of date (just like we have a note stating that due to unforseen circumstances that FastFAR may occasionally also go slightly out of date), but this is still less than satisfying. Yes, the current version on the FAA's website can in some sense be considered canonical, but you need to navigate carefully to make sure that you are indeed looking at their most current one, as this is often not clear. Admittedly, the GPO's website is better in terms of up-to-datedness, but this is largely an unsearchable and undercipherable mess - unless you happen to be our software robot, which continuously contacts the GPO and searches for FAR updates which it then repackages nicely for your for use in FastFAR. What about those "FAR/AIM" books with the current year printed on it? What about those subscription-based FAA-document CD-ROMs that I can get mailed to me for a ridiculous amount of money per year? First, about those books - they sure look "impressive" and "official", don't they? What with their dignified typefaces and patriotic cover art. In fact, many people have been fooled into thinking that such books, published by private companies, are in some ways "official." They are not. Rather, consider a typical book listed as "2019 FAR/AIM." To meet Christmas demand, such books are typically printed as early as Summer 2018. Add the time it takes to manually do the layout and all the other things that go into preparing a book, and such printed material may be as much as 18 or more months out of date. In fact, because the FARs are updated asynchronously, it is pretty well guaranteed that at least some parts of such books are out of date by their nominal first day of validity on January 1, 2019! Now you see why such book publishers go out of their way into making you think that you are getting something 'official.' This is the best they can do given that they are dealing with an inferior delivery mechanism. Couple this to the fact that such books typically cost about the same PER YEAR as what FastFAR costs for a LIFETIME license, and you'll see why those books are a bad idea. Now, about those CDs. There's at least one company out there that will, for a fee, mail you a CD-ROM of key FAA documents, the FARs amongst them, for a ridiculous yearly subscription fee. Such a delivery mechanism probably made sense before the advent of the Internet. Now, it is an anachronism. But then there's the question - but even if you go to all that trouble to manually receive a CD-ROM in the mail every two weeks and install it, you at least will get up-to-date information, right? We can't say for sure, but during a discussion we had with a company that did this, they indicated to us that their means of searching through FAR updates was to do so MANUALLY. So, unless they have changed something as to how they do this or you are prepared to believe that they employ some eagle-eyed person who does nothing but reads and compares FARs 24/7 (as our automated updater does), it seems at least highly likely that their material tends to be out of date. Oh yes, and then there's the matter of the ridiculous cost for their services. How do I know if a new version comes out? FastFAR will display an update window when it is connected to the Internet and it detects that new data is available from our servers. From there, it is only a few clicks to get the latest data. Simple. The trial period expired and I didn't get a good feel for the software! Sorry about that. There's not much we can do. Perhaps you can try it out on another computer? Alternately, why not just buy it - it's only $19.99 for a single-user nontransferable license. Can I install it on two machines if I paid for one license? If it is for YOUR OWN PERSONAL USE ONLY, then yes, you may. For example, you may want to install it on your laptop and at home on your desktop. However, installing it for somebody else's use is strictly forbidden. We hope you can find this arrangement to be fair. Why should I pay for FastFAR when the FARs are available online for free? In a word, advertising-driven copies of the FAR tend to be updated seldom if ever. More often than not, they're somebody's weekend project to try to get a few pennies of advertising money via traffic to their website which simply doesn't justify the work necessary to keep the material up to date. As a result, you get material that is highly likely to be out of date and so may get you in trouble (see our example above). Even the FARs on the FAA websites tend to not be as up to date as those in FastFAR (which come via the US GPO). Furthermore, what's online tends to be slow, hard to search, hard to read, hard to print out what you want, and so forth. * Disclaimer: at the time of this writing, FastFAR has been updated regularly for several years and it is our intention to continue upgrading it well into the future. However, as there are a number of circumstances that may be beyond our control, it is foreseeable that at some time in the future we might no longer be able to provide regular updates. Registered users are welcome to download the latest available version from us at all times, but registration of our software does not guarantee any specific duration of 'guaranteed' updates from us. Hey, even for one year, the price is very inexpensive. We'd just be remiss if we didn't put this disclaimer. Thanks for checking out the software!